Penguin Young Readers has just announced CARMELA FULL OF WISHES, my next picture book with illustrator Christian Robinson. This is a very special book for me (the story is set in a migrant community), and I can’t wait until folks get a look at the amazing illustrations! 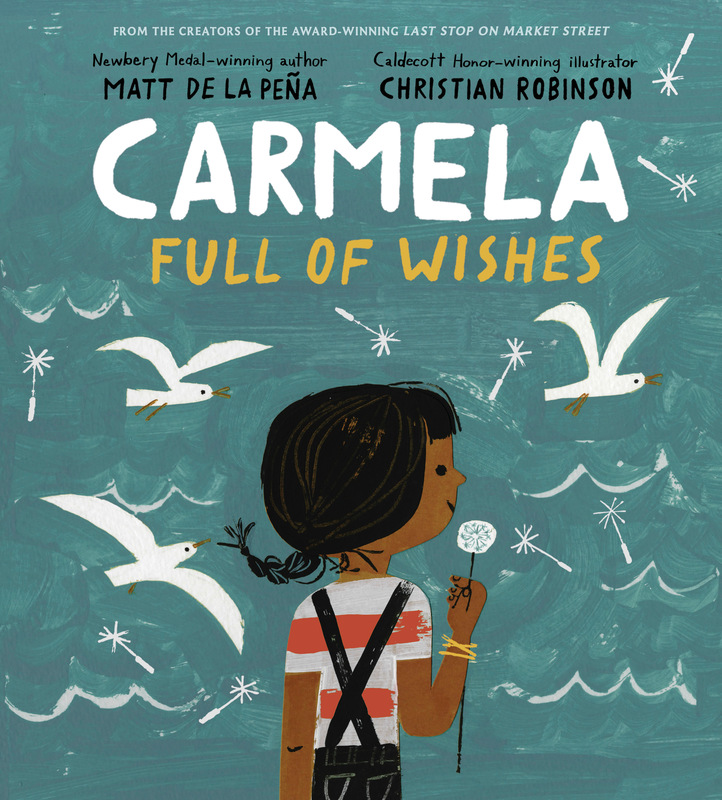 (New York, NY – January 16, 2018) — Author Matt de la Peña and illustrator Christian Robinson, the creators of the Newbery Medal- and Caldecott Honor-winning Last Stop on Market Street, will publish a poignant and timely new picture book, CARMELA FULL OF WISHES, with G.P. Putnam’s Sons Books for Young Readers, an imprint of Penguin Young Readers, on October 9, 2018. Like Last Stop on Market Street, CARMELA FULL OF WISHES illuminates the beauty of working class neighborhoods, and the power of community and family. Told through the lens of a heartfelt sibling story, the picture book explores what hope looks like in a migrant community steeped in Mexican culture. Matt de la Peña is the Newbery Medal-winning author of Last Stop on Market Street. He is also the author of Love; A Nation’s Hope: The Story of Boxing Legend Joe Louis; and six critically acclaimed young-adult novels. Matt teaches creative writing and visits schools and colleges throughout the country. Matt lives in Brooklyn, NY. You can visit Matt at mattdelapena.com or on Twitter @mattdelapena. Christian Robinson is a 2016 Caldecott Honoree and also received a Coretta Scott King Illustrator Honor for his art in Last Stop on Market Street. His picture books include the Gaston and Friends series; Leo: A Ghost Story; School’s First Day of School; The Smallest Girl in the Smallest Grade; Josephine: The Dazzling Life of Josephine Baker; and many more. You can visit Christian at theartoffun.com or on Instagram @theartoffun. When Carmela wakes up on her birthday, her wish has already come true—she’s finally old enough to join her big brother as he does the family errands. Together, they walk through their neighborhood, past the crowded bus stop, the fenced-off repair shop, and the panaderia, until they arrive at the laundromat, where Carmela finds a lone dandelion growing in the pavement. But before she can blow its white fluff away, her brother tells her she has to make a wish. If only she can think of just the right wish to make . . .